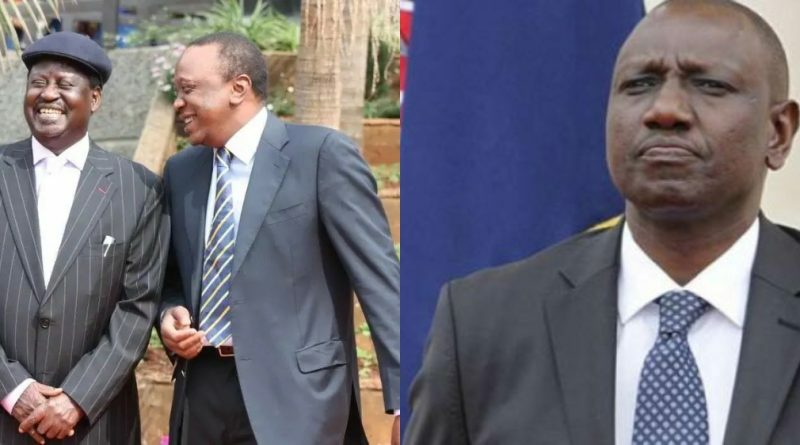 Following the recent appointment of Raila to the African Union by President Kenyatta, it is feared that the President is sidelining Ruto in favor of the former PM. The DP’s 2022 Focus Team representatives have indicated that the appointment of Raila as the High Representative for Infrastructure Development in Africa was new to the DP during the Mashujaa Day Celebration in Kakamega. The sources indicate that Ruto received the PM’s new appointment just like the ordinary Kenyan. He knew nothing about it as the former PM’s new position was announced at the Bukhungu stadium. The DP’s allies reckon that Raila’sappointment to the AU was a way of Uhuru preparing him for 2022 presidential race. It is also believed that the position would help the ODM premier accumulate wealth from multiple sources, including global companies. Most of these companies are believed to work through regimes. And since Raila is a master of regimes, his new position would reward him a lot of contracts. Now, there are many jitters in the DP’s camp, and his allies claim that Uhuru is ‘betraying’ him. Conversely, it is reported that the MPs had a plan of intimidating and forcing the country’s premier to declare his support for Rutoin 2022. According to the National Intelligent Services (NIS), the president intentionally delayed his arrival to remind the MPs who’s the boss and that he cannot be intimidated. It is obvious that Uhuru is a no-nonsense kind-of-guy. Word has it that their initial plan to intimidate the president led to their denial to speak in an event that was hosted in their home turf. This clearly shows that the president wasn’t going to entertain them. Kisasa News understands that Ruto is continually funding multiple groups to push the President to declare his 2022 presidential support for him. For example, the Rift Valley Council of Elders, one of the groups that are sponsored by the DP, has been challenging Uhuru to declare his support for the DP. Reports claim that the members pocketed ksh50,000 each to push the agenda. “We challenge Uhuru to come out clear and say whether he still supports Ruto’s 2022 presidential bid,” said Karanja Kabange, Ruto’s ally and a member of the Rift Valley Council of Elders. Furthermore, Ruto’s operatives were thrown out of the State House. He has also been left out of the major developments in the House of the Hill. This also links to the surprise handshake between Uhuru and Raila, which Ruto wasn’t aware of. Raila’s security detail was restored, and he has recently gained a lot of favor from the President. Sources also claim that Raila will be using Jimmy Wanjigi to award contracts to Chinese companies, and accumulate wealth for Raila’s 2022 presidential campaign. So, is Ruto’s dreams of becoming Kenya’s fifth president shattered? Time will tell.